OLDEMIRO BALOI, Minister of Foreign Affairs and Cooperation of Mozambique, stated that the nation was moving steadily towards strengthening its democratic institutions, for which it had undertaken a comprehensive public sector reform and decentralization process of the Public Administration. Mozambique’s main goal was to eradicate poverty, which necessitated capacity-building on such matters as climate change, energy and food security. “Mozambique and many other countries from sub-Saharan Africa are being ravaged by cyclical natural disasters,” which reduced land productivity. Yet, those countries did not have the requisite financial resources to mitigate the impact of climate change. In addressing those challenges, concrete steps were needed to strengthen the central role of the United Nations in global governance. He said that the General Assembly, as the Organization’s most representative and legitimate body, should be well-resourced with the necessary authority to assume its responsibilities, on behalf of the international community. As for the Security Council, it was widely agreed that its reform should be made a priority. A more balanced representation in the Council would be “more fair and democratic”, ensuring its ability to serve the security needs of the international community. “It is no longer acceptable that a continent that represents almost 30 per cent of the whole United Nations membership — and whose concerns constitute more than 60 per cent of the Council’s agenda — is not represented in the category of permanent member,” he asserted. He meanwhile acknowledged the progress made by the General Assembly on system-wide coherence and commended the establishment of UN Women. In light of his nation’s strong belief in “Delivering as One”, he called on the United Nations to support all countries that voluntarily embarked on that process. As concerned the maintenance of international peace and security, Mozambique was committed to continue sharing its experience in the peaceful resolution of conflicts, particularly with southern Africa, which he noted, had improved in that regard. Mozambique remained concerned, however, about the volatile situation in the Middle East, where conflict between Israel and the Palestinians continued to deprive the Palestinian people of the realization of all their fundamental human rights. 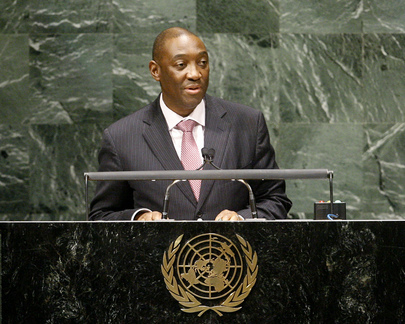 In the same vein, Mozambique reiterated its support to the right of self-determination for the people of Sahara.